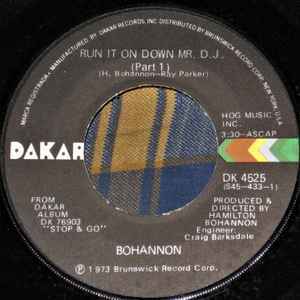 Bohannon* ‎– Run It On Down Mr. D.J. Manufactured By – Dakar Records, Inc. Published By – Hog Music, Inc. Same cat# with label variant here Run It On Down Mr. D.J. ℗ 1973 Brunswick Record Corp.
From the Dakar album DK 76903 "Stop & Go"
Search for Run It On Down Mr. D.J.